New multi-site video player enables remote campuses to seamlessly watch live broadcasts. 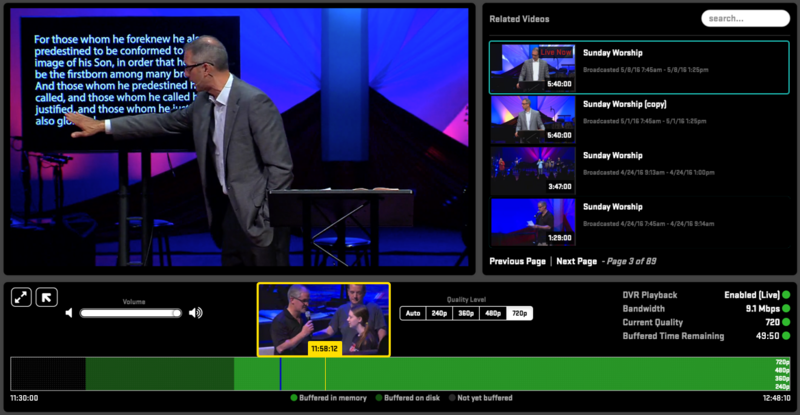 CLEVELAND, OH, July 14, 2016 — BoxCast, the Cleveland-based live streaming company, is launching its Multi-Site Video Player to enable remote church campuses to seamlessly watch live and recorded broadcasts. BoxCast’s advanced DVR player buffers the live broadcast locally and shows advanced statistics to ensure a beautiful picture every time. The application allows for advanced caching and buffering of live and recorded videos. It even includes a detachable remote control and monitor window to pause/rewind/seek, control volume, and playback quality as needed. The desktop application runs on both Windows and Mac OS X. For more information, check out https://www.boxcast.com/product/multi-site-player. BoxCast is a breakthrough streaming platform that makes it easy to deliver live, HD video and audio to anyone, anywhere, on any device. Launched in 2013, BoxCast is headquartered in Cleveland, OH.